Kashmiri pulao is one of the rich, aromatic rice dishes. It can be served at any festivities or celebrations. 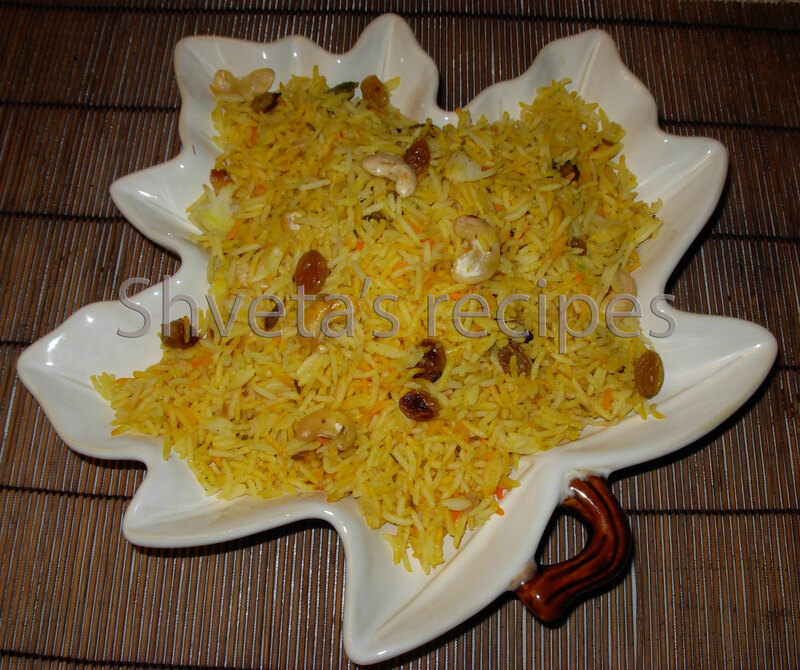 Saffron or Zafran gives kashmiri pulao pretty golden yellow color and makes it looks appetizing. Here I’m sharing with you my version of Kashmiri Pulao. 2. Take 2 tbsp of warm milk and add saffron strands. Keep it aside till milk gets rich golden yellow color. 3. Cook the rice with 1 cup of water and 2.5 cup milk. Let the rice cool completely or let it sit in the refrigerator for couple of hours after cooking. 4. Heat a pan and add oil and ghee. Briefly sauté cashews, raisins, almond slices and walnuts and keep aside. Sauté sliced onions till golden brown and keep aside. 5. Now in the same pan with oil and ghee, add cloves, cardamom, cinnamon and bay leaf. 6. Add cooked rice carefully and mix well. Add fried onions and nuts to it. 7. Stir in saffron milk and cook for few more seconds. 8. Kashmiri Pulao is ready to serve. Garnish Kashmiri pulao with fried nuts. Enjoy pulao at any meal time with raita and pickles.